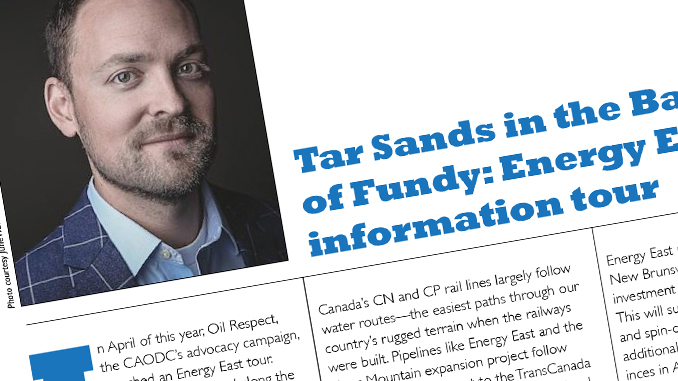 In April of this year, Oil Respect, the CAODC’s advocacy campaign, launched an Energy East tour. Our plan was to travel along the pipeline’s proposed route to deliver information to local areas about the safety of the project and its many benefits to Canadians across the country. We have so far spent time in communities, large and small, in Alberta, Saskatchewan, Manitoba, Ontario and Quebec. But we are far from the only ones who are on the road talking about Energy East. An article in Nova Scotia’s Kings Country Register highlights a recent event in Wolfville, N.S. hosted by The Ecology Action Centre, a group opposed to the project. The article provides a perfect illustration of why Oil Respect is still necessary, and why much more education is needed on Canadian pipelines in general. We know the majority of Canadians, including many in Eastern Canada, support building Energy East. But that is not the picture we are getting from the media or anti-development groups like Ecology Action. On a macro level, projects like Energy East make sense in terms of safety and the environment. Transporting oil by pipeline is less carbon-intensive than transporting crude products by truck or rail, both of which rely on yet more hydrocarbon resources to operate. In short, pipeline protestors are actually indirectly encouraging increased carbon emissions. Pipelines are safe, 4.5 times safer than rail as a means of transporting oil according to a 2014 study using Transport Canada data. Canada’s CN and CP rail lines largely follow water routes—the easiest paths through our country’s rugged terrain when the railways were built. Pipelines like Energy East and the Trans Mountain expansion project follow utility corridors adjacent to the TransCanada highway, further minimizing the risks to local water supplies. These same folks who are criticizing the retrofitting of 40-year-old pipelines to expand safety measures and market access should ask themselves why they are not equally concerned about transporting oil and gas via century-old rail technology. We notice that the Halifax-based Ecology Action Centre has no objection to the foreign oil tankers making weekly stops in Canada’s Atlantic ports. Atlantic Canada and Quebec spent $17 billion last year on imported oil from the U.S., Saudi Arabia, Algeria, Angola and Nigeria. Furthermore, these folks need to educate themselves about tanker safety. Global marine oil spills have been reduced dramatically over the past 30 years, largely due to developments in double-hulled tanker technology. Since the establishment of the Canadian Oil Spill Preparedness and Response Regime in the mid-1990s there has not been a single major spill from oil tankers or comparable vessels in Canadian waters. Energy East will ensure that Canadian oil is filling Canadian refineries. TransCanada has already invested more than $42 million with local businesses in New Brunswick on the project in areas like engineering, geotechnical analysis, surveying and translation. The 415 kilometres of the Energy East pipeline slated to be built in New Brunswick will represent a $6.5 billion investment into that province’s local economy. This will support over 3,771 full-time direct and spin-off jobs per year in N.B. Hundreds of additional jobs will be created in other provinces in Atlantic Canada, not to mention the thousands more created in other provinces along the project’s proposed route, and the money remitted to local businesses like hotels, restaurants and shops. This is the perspective of only one of the many group and dozens of municipalities in Atlantic Canada who are supportive of Energy East. It’s time that anti-pipeline activists like the members of the Ecology Action Centre started being straight with Canadians. Until then, keep an eye out for future Energy East tour dates from Oil Respect!